The World Health Organization said Monday that Vietnam‘s mandatory helmet law helped save more than 1,000 lives since it was introduced a year ago but that more loopholes need to be fixed. Monday marked exactly one year since the government required all motorcyclists to wear helmets. There were 1,400 fewer road traffic fatalities and 2,200 fewer serious injuries in the year ending October 2008 compared to the same period a year previous, the WHO said, citing a report by the National Traffic Safety Committee. Nearly 13,000 road deaths were recorded last year, one of the world’s highest rates per 100,000 with the majority of accidents involving the ubiquitous motorbike, which is the country’s main mode of transportation. 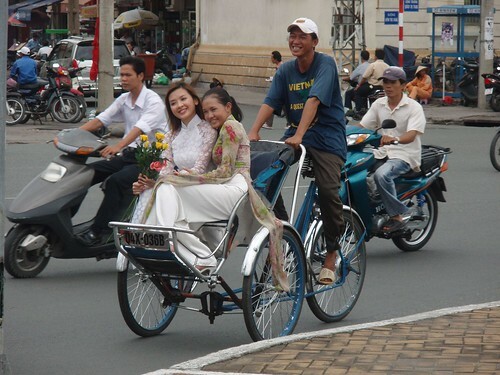 “Thanks to the introduction of mandatory helmet laws there are more people alive today to enjoy time with their family and look forward to Tet celebrations,” Jean-Marc Olive, WHO representative in Vietnam said in a statement. Tet is the Lunar New Year festival which starts on Jan. 26. “The alternative does not bear thinking about. There is no simpler message — helmets save lives,” he said. WHO praised the Vietnamese government for its recent decision to give the police power to fine motorcycle riders and passengers who do not correctly fasten their helmets. If a helmet is not fastened, police will consider this “non-wearing” and the rider and passenger can be fined up to 200,000 dong ($12). WHO said it is also working with the government to develop a law that penalizes adults who allow children to ride motorcycles without proper helmet protection. Currently, children under 16 years of age, or the adults that are responsible for them, cannot be financially penalized for not wearing a helmet. Simple things like seat belts, childproof medicine caps and fences around pools could help prevent up to half of the 2,000 accidental deaths of children that happen each day around the world, UN officials said Wednesday (10 Dec). More than 800,000 children die each year from burns, drowning, car accidents, falls, poisoning and other accidents, with the vast majority of those deaths occurring in developing countries, according to experts and a report released Wednesday by the World Health Organization and UNICEF. Tens of millions more suffer injuries that often leave them disabled for life, said the report which was launched at a meeting of global health experts in Hanoi. The World Report on Child Injury Prevention 2008 does not include injuries caused by domestic violence. The problem is most acute in Africa and Southeast Asia, but no country is immune, conference participants said, issuing an urgent call for action. You are currently browsing the archives for the accidents category.